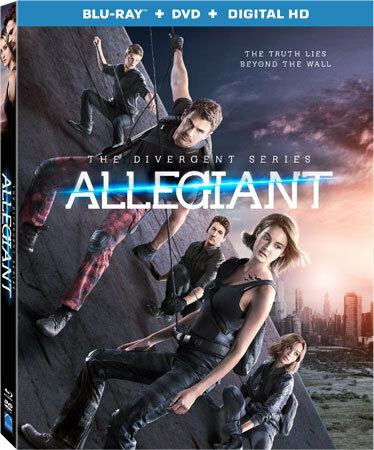 Kidzworld watched the Blu-ray for Allegiant, the next in the Divergent series of films. Do all the tech additions and story changes work? Are there cool extras? Read our review. 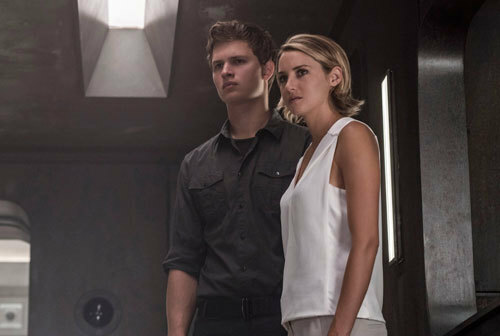 In The Divergent Series: Allegiant, Tris Pryor (Shailene Woodley) and love Tobias (alias Four played by Theo James) have learned that they are living in an experiment watched 24/7 from afar by “Pure” folks outside the wall at “The Bureau”. 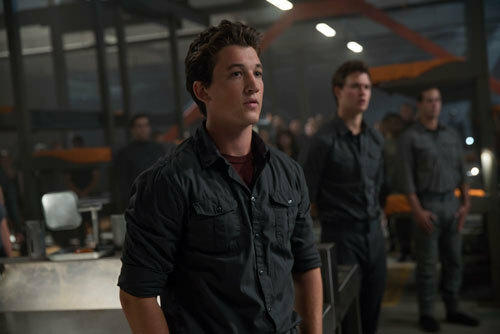 At home in Chicago, Four’s mom Evelyn is at war with Johanna’s Allegiant followers. Should the lovers and friends go over the wall? Will life be better outside….or much worse? As tensions grow inside Chicago, Tris, Caleb (Ansel Elgort), Christina (Zoe Kravitz), Four and Tori (Maggie Q) escape over the huge wall and Peter (Miles Teller) leaves separately but all find that a red, nuclear-blasted landscape is everywhere. They are rescued by high tech soldiers who take them to a city built on the ruins of Chicago’s O’Hare airport. In the high tech “Bureau” headquarters, the group is decontaminated and learns that the whole city of young people has grown up watching them on a direct TV link into Chicago. They are celebs. They are told by The Bureau of Genetic Warfare that Chicago and other cities were an experiment after genetic wars hundreds of years ago. The factions were a hope that people would be less warlike toward one another. 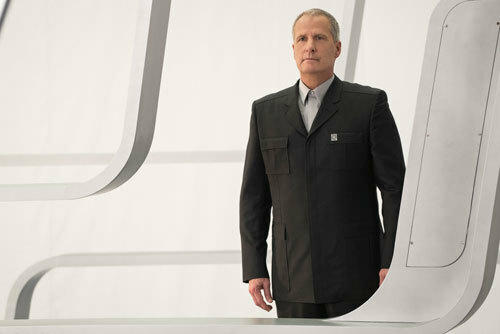 The leader David (Jeff Daniels) tells Tris that she is the only “pure” person coming out of the experiment. Four is taught high-tech weaponry, goes outside and learns that kids in the Fringe areas are being taken unwillingly from their parents. Some of the parents are killed. There is evidently nothing kindly about the Bureau. Tris, who is so far believing David’s benevolent b.s., must be told. When David explains to Tris that her mom was once from the Fringe and went into Chicago to help the experiment, she starts to believe that the Bureau is full of good guys especially when she witnesses her mom’s own recorded memories of her past. She finds that Peter and Caleb have been assigned to viewing pods to spy on what is going on in Chicago for the Bureau. On returning from the Fringe, Four asks Tris how she knows David isn’t lying. The Bureau is stealing children and using a serum/gas to wipe their memories and they have much more evil stuff planned. Four wants to head back to Chicago Tris isn’t sure what to do. The two have an argument. 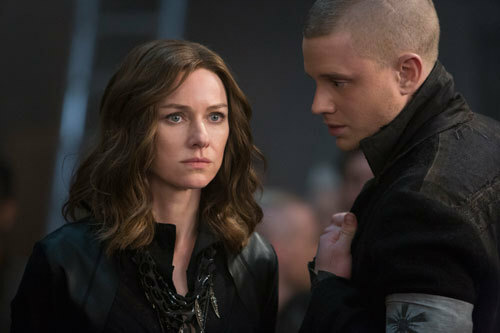 Will Tris come to know the truth about the Bureau and fight for her friends and what is left of Chicago? Allegiant: Book to Film has filmmakers and Shailene talking about dividing the book into two films and all the new high tech planes and weaponry etc. added while the characters were kept the same. Interesting. Battle in the Bullfrog: Stunts and Choreography – breaks down a fight sequence on the Bullfrog, one of the Bureau’s fighting ships. 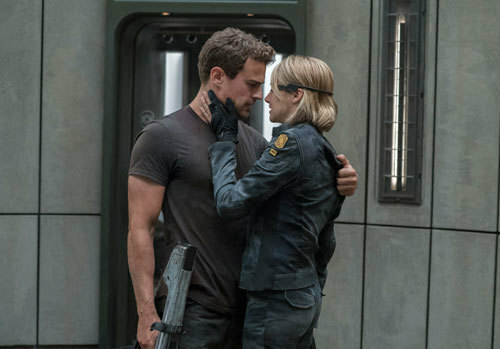 We see Theo James fighting on the ship set while a giant gimbal device shakes it around. I love these “you are there” things. Finding the Future: Effects and Technology examines the design and outcome of vehicles, weapons, drones and props created to make the Bureau H.Q. way more high tech than in the book. Cast members comment on the fun they had with the techie stuff. We see them or wires supposed to show them floating in giant bubble transports. I like this feature the best. Characters in Conflict: Motivations Behind the Film’s Antagonists – This feature centers on the “bad” guys of the movie. Actors Naomi Watts, Octavia Spencer, Jeff Daniels and more talk why their characters do what they do. Interesting. The Next Chapter: Cast and Characters – We are on set and the cast talks of getting together like a family again for this chapter of the series. It’s easier when you already know the other players but the new actors were also welcomed. Building the Bureau goes into the amazing set designs and building for the re-creation of O’Hare Airport in the far future. Production Designers talk about using CGI and building some actual sets. The designs are great to look at. Actor Bill Skarsgard gives us a tour. Audio Commentary by the producers rehashes some of what is in the extras with a few additional tidbits. The best things about this chapter of the Divergent series are the cool flying ships, weaponry and other techie stuff the filmmakers added. At first I thought they had changed the ending from the novel then found out that there is supposedly one more chapter called Ascendant next year. Let’s face it, if you are a fan of the novels and are following the movies, you’ll want to collect all the Blu-ray's or DVDs. This one is visually cool. I still like a blooper reel with actor goofs and we don’t have one here but the extras are worth a watch. We go 3 stars. The Divergent Series: Allegiant is available on Blu-ray + DVD July 12th! 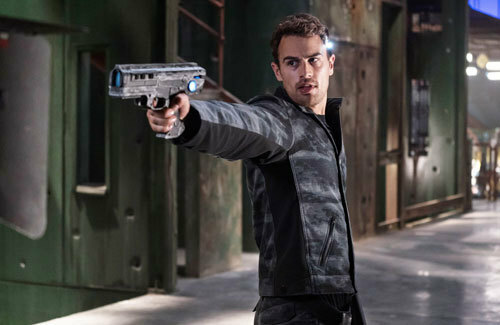 Are you a fan of the Divergent series of novels and/or the films? Are you collecting them all or just not your thing? Leave a comment below! Which book is your favorite from The Divergent Trilogy?